Student Advice Column: How Do I Tell My Friends? How do you bring up the fact that you have diabetes around peers and friends in college? It is important that most people you are regularly around know that you have diabetes, and know what to do in emergency situations; however, I don’t believe that there is any specific way to bring it up. For the most part, the fact that I have diabetes just comes out in normal conversation. The biggest thing to remember is that you can’t be shy about telling people that you have diabetes, it is important that you own it, and feel as if you are proud to have it.This doesn’t mean that everyone you’ve ever met has to know that you have diabetes, in fact, about 90% of the people in my classes don’t know I have it, but the people I sit around, my professors, and my roommates all know that I have diabetes as well as know what symptoms to look for in high or low situations, and what to do in emergency situations. College is different than high school because in high school you can tell friends or classmates once, and then everyone knows! In college, you get a new set of classmates and teachers each semester so you may feel like you are always informing people you have T1D. Having a solid plan to communicate you have diabetes makes saying it multiple times throughout the year a little less taxing! I believe the best way to go about telling peers and friends in college you have T1D is to be honest and straightforward. Usually, you can bring it up naturally in a conversation. If a friend notices you using your pump, pen, or blood sugar tester, you should use it as a chance to mention you have T1D. You can tell them why you are doing what you are doing and use it as a teaching moment. You will find most people will be interested in learning. Teaching people rather than just blurting out that you have diabetes makes the conversation more interesting for you and maybe a little less intimidating to the person you are telling. Remember, you do not have to tell everyone about your diabetes, but you should tell those close to you and your professors. It is important that people you frequently spend time around as well as those that you are close to know that you have diabetes. It can be frustrating to constantly have to inform and educate new professors and classmates about diabetes but it is important, especially in case of an emergency scenario! For me, I find diabetes usually comes up pretty naturally with both my friends and peers. They will see me using my insulin pump (or hear it beeping) or see me testing my blood sugar in class or before meals.I try and take this as an opportunity to educate them about diabetes! This gives them an opportunity to ask questions and to learn about diabetes in a casual and natural way. I have found that bringing it up naturally makes telling people less uncomfortable for both myself and others. 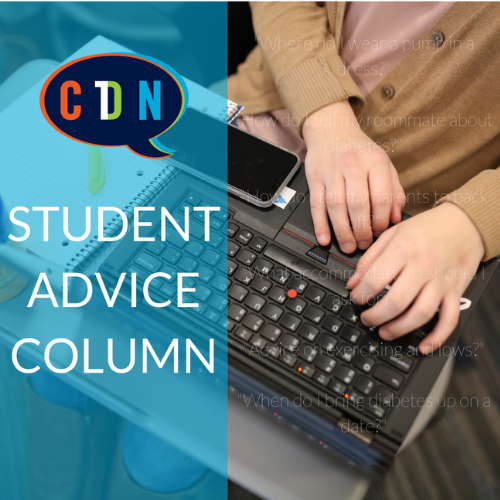 Editor's note: Ask an anonymous question for our student advice columnists here!